The teacher-mentor programintroduced in our college in 2007 has literally become popular among teachers,parents and students. It has become an effective tool to strengthen a healthydialogue amongst the above stake holders of higher education. This has led to amore meaningful relationship between the teachers and the students in thecampus over the years. An orientation program, conductedby Principal and Vice Principal, for parents and newly admitted students of FYBCOM / FYBA was held from 5 to 8 July 2011, to familiarize them with therules and regulations of the degree college education in general and the newexamination system in particular. Over 75% of the students and parentsenthusiastically participated.. The feedback revealed that they were extremelyhappy with the decision taken by the college in this direction. The firstmentor meeting was held on Saturday, 9 July 2011, for all the students alongwith their parents. Mentors have spelt out the agenda for the students in thenew academic year. The attendance in the meeting was impressive. The second mentor meeting washeld on 9 September 2011, for the students of FYBCOM / FYBA and SYBCOM / SYBA.Problem-reporting forms were filled up by the students. The mentors encouragedthe students to actively participate in curricular and extra- curricularactivities. The third mentor meeting was held on 14 February 2012. In thismeeting, the result and attendance record of the students in Semester I andTerm I were announced in the presence of parents. As the semester result wasnot up the mark, some students abstained from this meeting. However, theparents have registered their full support and appreciation towards the stepstaken by the college in disciplining and guiding the students. The fourth and final mentormeeting was held on 11 Feb 2011 for FYBCOM/FYBA sand SYBCOM/SYBA students. Itwas an examination special meeting aimed at encouraging them to do well in theSemester II and II term examinations. Students were encouraged to approach theirrespective teachers in case of any difficulty, in the teaching- learning process. The Tutor-Mentor programme, aimed at ensuring cordial relationship between the mentor and ward, has been successfully implemented in our college. The nature and scope of tutor-mentor programme has been widened to include Quality Improvement Programme in the college, as per the ISO requirements. 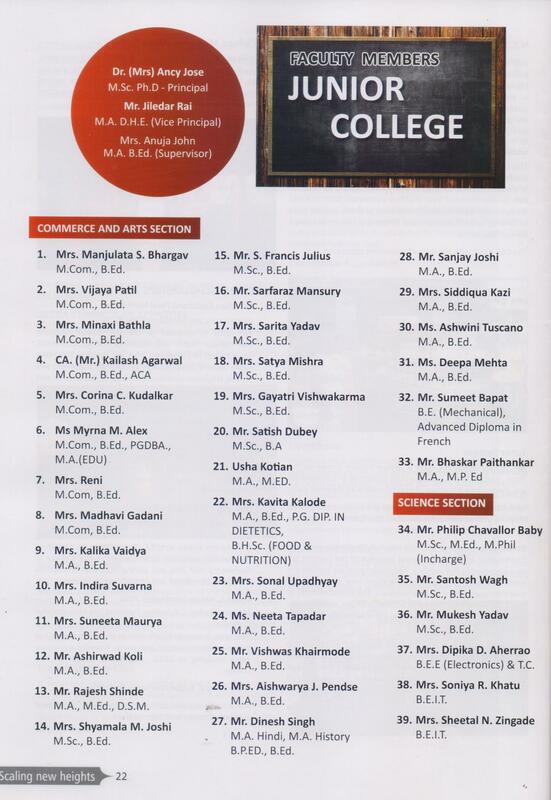 The programme introduced in the college in 2007 has been well received by teachers, parents and students. Four mentor meetings are conducted at regular intervals for the benefit of the students. Teachers (Mentors) encourage the students to actively participate in curricular, co-curricular activities. Students are encouraged to approach their respective teachers in case of any difficulties faced in the teaching- learning process. It has become an effective tool to strengthen healthy dialogue among the two important stake holders of education. This has created a more meaningful relationship between the teachers and the students over the years. For communicating the evaluation report of the students the institution plans meetings with the parents for briefing them about the progress of their wards on a regular basis. Teachers evaluate themselves and submit their self appraisal reports every year.